The case is essentially broken up into three regions. (1) motherboard (2) power supply and (3) drive bays. The motherboard, being the most important region has the most amount of space, measuring 13" x 17" x 8-1/4". The motherboard has about 3" of space overtop of the slot cards for maximum airflow. Airflow is the key in this region, which can become choked with cables. The power supply is portioned out a space measuring 9-3/4" x 10-3/4", with about 5-1/2' of space directly above it for an extra hard drive or two. The rest of the space is taken up by the drive bays, which have a inch or so of free space around them. 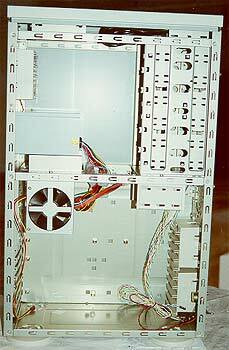 Access to the inside of the Supermicro 750 is controllable. How? by a small lock on the bottom of the front bezel. The lock can be actuated to prevent the bezels' removal. Without removing the bezel it is impossible to open either of the swing-out side panels. With the bezel removed, three screws on each of the leading edges of the panels must be loosened. Only then will the panels be able to swing open. Depending on what kind of work needs to be done on the case, each of the panels can be removed altogether very easily. This system is a tool intensive one, but works well for server-class environments where daily case access is not an issue. I would have personally found it helpful to have some type of built-in notch or retaining clip to keep the doors shut however. As it stands, pressure must be applied to the doors to keep them closed, then the screws tightened to keep the panels in place. So, basically they have to be screwed in closed before the bezel can be attached. The motherboard tray does not slide out the back of the case, so installation of the motherboard is done directly in the frame of the case. Little stand off clips are attached and then the board is dropped in and screwed on. From a system building perspective, if only one computer is being made this isn't so much of a problem. If multiple computers were being made for an office or lab, this configuration would become awkward quickly as the case is large and difficult to move around. For those of you who need to know, the case ships with a Venus or Caveman type ATX 2.01 compliant I/O shield. The designers of this case decided long ago to stay away from rails for the 5.25" bays. Thus every single device that goes into the bays needs four screws, and that means both side panels must be opened. Even though rails don't negate the necessity of opening the case up to attach cables, opening both sides of the case just adds extra work to the job. If a sys admin is doing this, it means their time is being wasted. So while the case appears to be designed on the outside for the by-the-feet user, the guts seem to be targeted towards the open-it-up-once server class. See a contradiction?